The NVIDIA GeForce GTX 660 Ti is a high-end desktop graphics card based on the GK104 Kepler chip. It supports DirectX 11 and is manufactured in 28nm at TSMC. 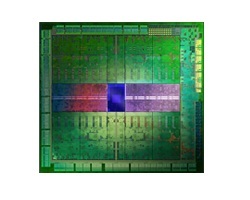 The core clock can be up to 980 MHz under load (GeForce Boost) and is a tleast 915 MHz. The GDDR5 VRAM is usually clocked at 1500 MHz (6000 MHz effective data rate). Due to the higher core clock speed, the performance of the desktop GTX 660Ti is above the mobile GTX 680M (altough the 680M offers a wider memory bus of 256 Bit). Demanding games of 2013 should run in 1920x1080 with maximum settings and 4x Antialiasing fluently. Only Company of Heroes 2 and Hitman: Absolution scored below 30fps in our benchmarks on the average. The chip offers the 5th generation video processor VP5, which is able to decode MPEG-1, 2, 4, H.264, VC1/WMV9 with a resolution of up to 4K. Furthermore, the included vidoe encoder called NVENC is able to encode H.264 vidoes without stressing the CPU. The Geforce GTX 660Ti is rated at 150 Watt TDP and the default design uses two 6-pin power connectors. Beware: For our benchmarks we used a slightly overclocked version that ran with 980-1059 MHz compared to the default 915 - 980 MHz.